Nestable Panel Cart. Unique design saves valuable space when stored. 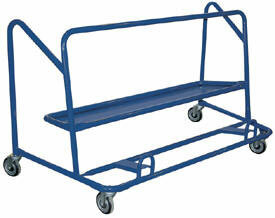 Overall size of each cart is 72½"W x 32½"D x 39½"H. Each additional cart only requires an additional 10½" of space. Features front storage area for handling paneling and sheet goods. Rear shelf is ideal for storing smaller products. Each unit includes (4) 5" x 1¼" poly-on-poly swivel casters; one with a total locking brake. Welded steel construction. Powder coat blue finish.Unique design saves valuable space when stored. Overall size of each cart is 72½"W x 32½"D x 39½"H. Each additional cart only requires an additional 10½" of space. Features front storage area for handling paneling and sheet goods. Rear shelf is ideal for storing smaller products. Each unit includes (4) 5" x 1¼" poly-on-poly swivel casters; one with a total locking brake. Welded steel construction. Powder coat blue finish. Specs: deck size 72.5" x 32.5", capacity 2,000 lbs, Caster Size 5" x 1-1/4", Caster Type Poly-On-Poly.